WHAT THE DUCK?! WHERE'S THE DUCK?! - LOS ANGELES - EAT WITH HOP! When the result of an artwork piece (by Dutch Artist Florentijn Hofman) is basically a gigantic 6-story tall vinyl inflatable "rubber duckie", crowds of people are bound to be attracted for photo opportunities...right?! Well that's exactly what Nancy and I expected when we were on the search for this gigantic rubber duckie! After driving via u-turns and crossing the Port of LA bridge (freeway 47) many times, we disappointingly found out that actually the rubber duckie is on holiday. What? It was a Sunday morning, during Labor Day Weekend and apparently the Rubber Duckie also took advantage and relaxed on this holiday weekend too. I first heard about this gigantic cutie from seeing photos of it from my friends around the world on Facebook. This traveling duck has been floating across the world since 2007 to awe everyone and I was hoping that it would one day make an appearance in California! My wish finally came true a few weeks ago when I saw it on the news on television (yes I still watch the news on T.V.). 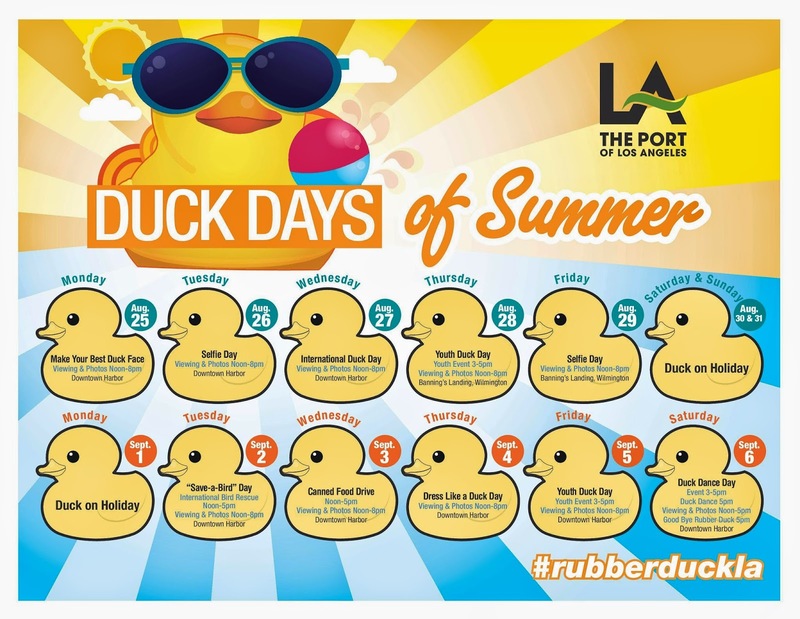 The Rubber Duckie was the special guest for the Tall Ships Festival located at the Port of Los Angeles. Immediately I went to look it up online and found out that there is an admission fee for this festival. And it's not cheap either! It was more than $10. I only wanted to see the Rubber Duckie but I'm too broke right not for that. Fortunately, after the Tall Ships Festival ended on the 24th of August, it was announced that the Rubber Duckie is here to stay for 2 more weeks until September 6. That's right y'all! And for free too! Of course I gotta get my hands on this right?! Now the most annoying thing that happened on Sunday morning was finding articles of articles about the Rubber Duckie without any useful information. It was extremely difficult to find more information about the duck aside from it's appearance at the Tall Ships Festival and that it would stay for 2 more weeks until Sept. 6. Where is the duck now? Why don't we see the duck? And what are the exact directions for the location of the duck?! These were all burning crucial questions Nancy and I faced before we found the defining super helpful (the one helpful website) website that features the Rubber Duckie calendar. According to that calendar, the Rubber Duckie is on holiday and not available for viewing for Labor Day weekend. Well goshdarnit I wish all the other articles mentioned that! To make up for the trip, Nancy and I ended up going to Round 1 nearby to take some photostickers and filled our hungry-for-lunch bellies with samples from Costco. Overvall, even though we didn't see the duck, we learned 2 valuable lessons: dig up as much information as you can before you go somewhere and be careful of holidays! I'm sad I couldn't see the Rubber Duck either :( I hope it comes back soon again! I read an article that they have a Giant White Rabbit in Taiwan! I hope the Giant White Rabbit comes here !